Do you remember the popular children’s hit series, The Wild Thornberrys that premiered in 1998 and ran for six years? My niece absolutely loved this show and I remember it as a wildly entertaining show for kids. I am very excited to share The Wild Thornberrys with my own young children as the entire first season has been recently released in a fantastic 4- disc DVD compilation. Shout! 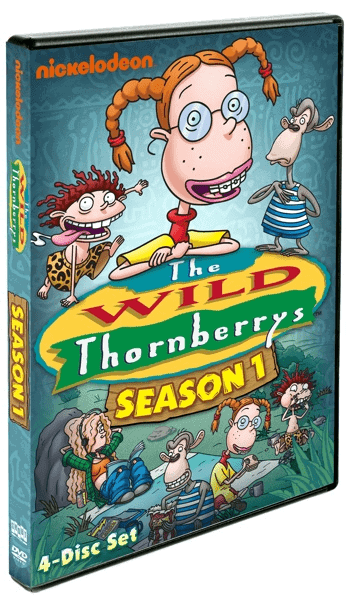 Factory along with Paramount Home Entertainment and Nickelodeon are proud to share The Wild Thornberrys: Season One DVD with fans of the classic Nickelodeon hit and new fans like my children. This collector’s DVD compilation features 20 action packed adventures which follows the eccentric and zany Thornberry family on their travels around the world in their CommVee (Communications Vehicle) looking to feature rare animals on film. I love how this show introduces children to exotic locations and is full of fun and adventure. The youngest child in the Thornberry family, Eliza has the ability to communicate with animals and in each episode she interacts with a wild assortment of animals on numerous continents including silverback gorillas (my kid’s favorite), pythons, and antelopes. We had recently learned about the rain forest so my children were very excited when the Thornberry family traveled to South America and encountered Capybaras and Tapirs which we had previously discussed in class. This series has colorful animation with an all star voice cast including Lacey Chabert (from Party of Five), Tim Curry (The Adventures of Jimmy Neutron) and even Flea (the Red Hot Chili Peppers). With a suggested retail price of only $29.93 for this collectible 4 DVD box set, The Wild Thornberrys is sure to be a hit with both old and new audiences…….I know that my family (including myself) is really enjoying it! This series brings back great memeories of watching with my oldest daughter. We had the game and the books, too! Our babysitter’s sister looked just like Eliza-glasses, red hair and all! Needless to say, she was not a fan of the show! I used to watch this show when I was in HS. I try to get my kids hooked on it, but there still pretty young!